Rapiro now available in Japan and some other countries! Note: Not a toy. 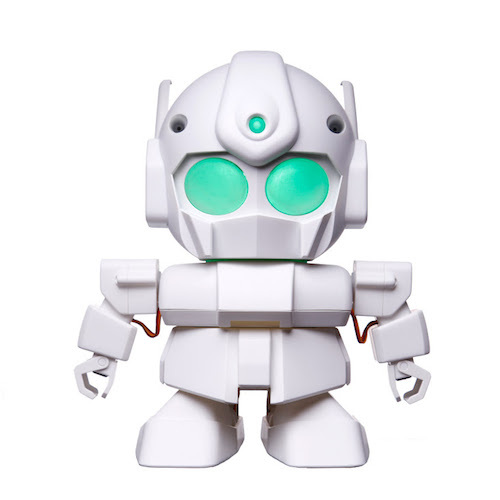 DIY model robot kit for hobby and for education in software engineering and robotics area. The users have to assemble the parts and program the behavior and actions. Rapiro was designed for Raspberry Pi model A and B. You can also install Raspberry Pi model B+ with small modifications to the plastics parts of Rapiro. See the compatibility information of Rapiro and the model B+. For more information, please find Parts List. Note: Raspberry Pi, sensors, battery and AC adapter are not included. Servo motors may degrade over time with use. Rapiro is easy to assemble! 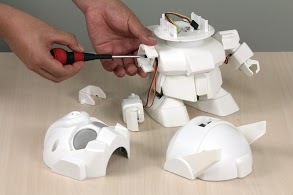 With only a few screwdrivers, anyone can assemble a Rapiro by following the simple step-by-step instructions. It comes with a pre-programmed board, so your Rapiro works right away once assembled. The Rapiro board is Arduino-compatible and you can program it using the Arduino IDE. 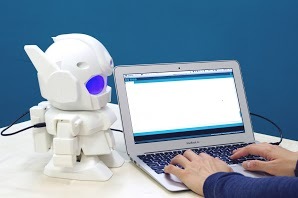 Your Rapiro can dance or sweep your desk if you program it to do so. Rapiro has countless possibilities for expansion! By mounting a Raspberry Pi and sensors (sold separately), you can customize your Rapiro anyway you want. In case of manufacturing related defects, malfunction or missing items in the kit, please contact: defect@rapiro.com within 3 months of the delivery. We can send you the replacement parts for free. Customer service is available Monday through Friday 10:00 to 18:00 except public holidays, New Year and Summer vacations. Do note that this product is an assembly kit. We do not indemnify any damages due to mistakes made during use or assembly. The servo motor, by its very nature, can be deteriorated depending on the frequency of use. All the parts included in the kit can be purchased separately as replacement parts. You must use the following battery. Note: If the charging of batteries is incomplete, servos do not work correctly with noise. You should fully charge the battery before you turn on the power. You cannot use Alkaline or Manganese battery. You must use the following standards AC adapter. Note: Even if the rated value satisfy the conditions, sometimes it does not work by the electric property or quality. For more information, please see this page.